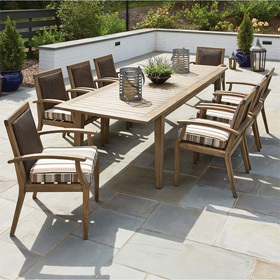 Refresh your patio style with this modern hi-top dining set, which supplies stylish accommodations for two individuals. The outdoor bar stools and bar table included in the set have eye-catching frame designs, exposed aluminum accents and subtle Charcoal Gray finishes. While this manufactured wicker arrangement has plenty of style, it's also perfectly functional, providing reliable all-season performance for contemporary outdoor spaces. Bar Stools 22"W x 21.5"D x 41"H 25 lbs. Bar Table 24"RD. x 40"H 30 lbs.